Learning to like Sushi: Bullet Train, Bullet Train, Yeaahh! So Faaasst! Bullet Train, Bullet Train, Yeaahh! So Faaasst! As summer came rushing to an end, Josh and I decided that we should take a short trip up to central Japan, to visit some of our great friends, Kelly and Corey. They were our neighbors when we lived in San Diego several years ago and we have been in touch through our many moves around the country as well as the world. Between the two families we had been trying to manage a trip either here to Sasebo, or there to Atsugi for a while now, but it just hadn't happened. Kelly and Corey are about ready to leave Japan and head to another duty station, so Josh and I decided it was now or never! Although we live on different islands, about 17 hours away from each other by car, that didn't stop us! We decided we would just cross another thing off on our bucket list of things to do in Japan, and hop on the Bullet Train, or as the Japanese call it, the Shinkansen and head on up to Atsugi. It was an all day affair, but it was worth it! 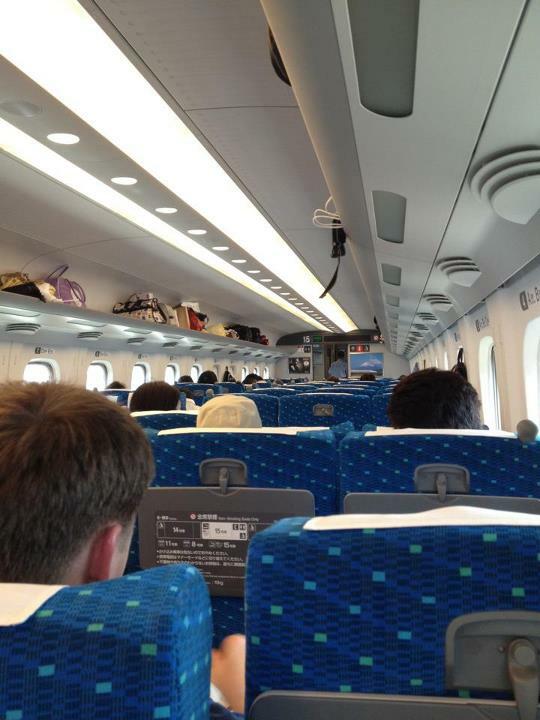 The bullet train was fun and it looked JUST like the interior of an airplane. As we went from station to station, speeding down the tracks at a speedy 100+ miles per hour, we got to see some of the beauty Japan has to offer. My favorite view was of Mt. Fuji... Isn't it just amazing?!? Our main reason, (well, my main reason and perhaps Kelly's too) for us going up to visit on this particular weekend, was because she's always telling me about the "Shrine Sales" that are held up in the Tokyo area. 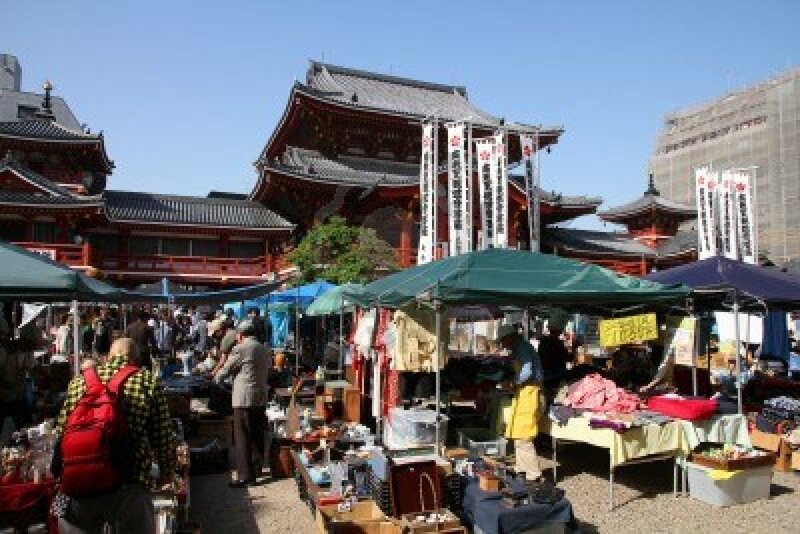 I guess we don't have such things down on Kyushu, but from what she was telling me, I knew I really wanted to check it out!! After all, I'm a recycle shopping addict!! This particular sale happened to be that weekend, so we figured we'd plan the trip for then. 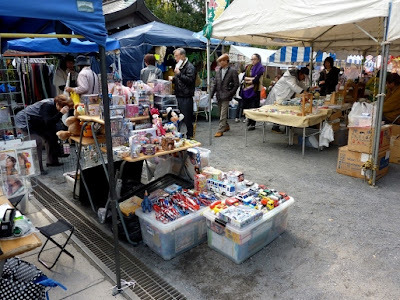 A "Shrine Sale" is a giant recycle shop, or for those of you in the states, a big Goodwill, (with much better stuff) outside, with hundreds of vendors and thousands of people and it goes on for 6+ blocks!! It's a bunch of second hand stuff, that people don't want and sell to others. HOWEVER, these second hand shops are like NOTHING you've ever experienced before. It could be because I'm American and I think Japanese stuff is so much cooler than American stuff, but it seems to be something that a lot of people, American and Japanese enjoy. I wish I had taken a picture or two from the shrine sale I went to, but I didn't, so I found these on line.. I had such fun looking through all of the bins and piles of stuff, chatting with Kelly and another friend who lives up there, Sandy. I found many kokeshi dolls to help aid my kokeshi addiction and a few other small things. I very easily could have spent all day there just looking and looking. There were thousands of Kokeshi dolls and no way I could have purchased them all, although Josh swears I did attempt to! Perhaps I will do a post showcasing my collection some time?? After we were done with our morning shopping excursion, we headed back to base to get ready for the Bon Odori festival, that was being held later that evening. Kelly and her family were very involved in the entire festival, with Kelly dancing and her two oldest boys playing Taiko Drums. I have many pictures of that evening and all of thefun we had. Hannah got to dress up in a Yakata (summer Kimono) and even had a very nice Japanese lady help her put it on correctly. Stay tuned for another installment of, " Bullet Train, Bullet Train, Yeaahh, So Faaast! 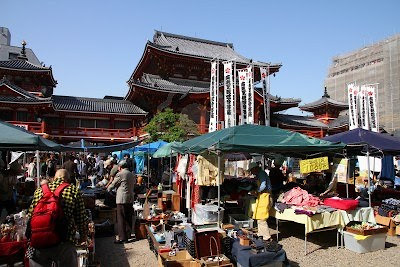 ", to see pictures of the festival and of Hannah all dressed up in her beautiful Yakata!!! Campaign for a new Mac Book! !